I have shared many strawberry recipes. 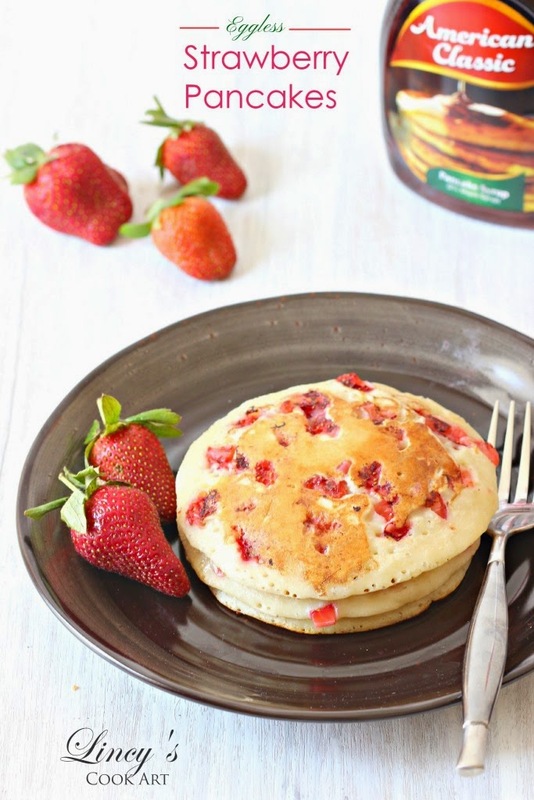 This one is a pretty easy to prepare breakfast using strawberries aka Strawberry pancakes. Easy as well as healthy. I have added partially Whole wheat flour to make this pancakes and gone with an egg less version. 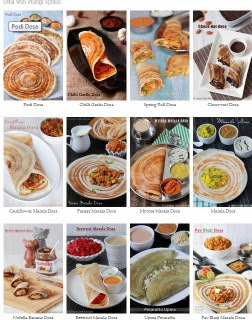 I am not a big fan of pancakes with eggs but once I tried the egg less version, I started liking this version than the one with eggs. Easy to make colourful breakfast with added fruits. Kids love this breakfast as it is absolutely colourful and sweet. Checkout my other strawberry recipes here from beverages to desserts. In a bowl add together all purpose flour, wheat flour, baking powder, baking soda and mix well with a whisk to evenly mix all the ingredients. In a bowl add the yogurt and beat well without any lumps. Now add the sugar and salt and beat well until dissolved. Add the flour mixture sifted and kept a scoop at a time and mix well. Once the mixture starts to becomes thick add some milk and loosen the batter. Like wise add milk and flour alternatively till the whole lot finishes. The consistency should be that of an idli batter. Using the whisk mix well with out any lumps and set aside for 10 -15 minutes to ferment the batter. Heat a nonstick pan and add half a teaspoon of butter and cook the pancakes on low flame. Once the butter melts add a ladle full of batter and do not spread the batter. Sprinkle a chopped strawberry on top. Close with a lid for even cooking once the top of the pancakes forms air bubbles slightly flip the pancake using a ladle. Cook the other side till golden colour appears. Dust with powdered sugar on top to cut the sourness of the strawberries or serve with honey/pancake syrup/maple syrup drizzles on top. Super hit! I tried this today for breakfast, and it was a hit in my house! My toddler gobbled them up happily! !